Blast Technology are UK leaders in Dust-free Captive Shot Blasting services, Sandblasting, Open Blasting and Mobile Grit Blasting. If you have an industrial concrete floor in need of cleaning or preparing, we are here to help. From car parks to warehouse floors and roads. We are based in Leicestershire and provide a fast, competitive and nationwide service with customer satisfaction at our core. At Blast Technology, we have the equipment and experience to suit your business and your budget. We use the latest in compact, dust-free and low noise captive shot blasting technology for preparing and cleaning concrete floors. We will blast off dirt, coatings and lines leaving your concrete floor clean and ready for any new surface coatings. No floor is too big or too small – indoor or outdoor. Preparing new and existing car park surfaces. Concrete shot blasting. Captive shot blasting to cost effectively remove existing failed coatings from large warehouse floors. 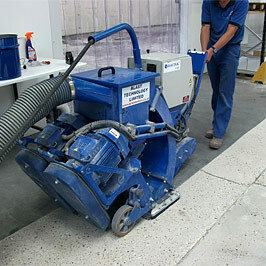 Captive shot blasting combined with diamond hand grinding is an ideal solution to preparing factory floors. Road surface preparation for local authorities and specialist contractors. Preparing large areas very quickly - vitally important with weather dependant operations such as re-waterproofing. See how it's done from blasting concrete floors, removing whitewash from brickwork to producing anti-slip surfaces. 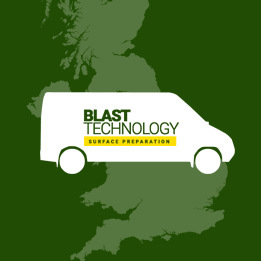 Blast Technology are based in Leicestershire in the Midlands. We provide a nationwide service using our own fleet of vehicles fitted with onboard generators and compressors. This gives us the flexibility of being fully self-sufficient and without the need of any on-site power requirements. Contact us today for a shot blasting or floor preparation quote.